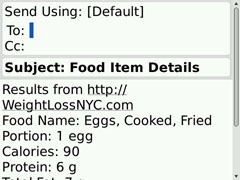 Type in a keyword such as egg, bread, salmon, etc. Scroll and click on the item of interest, a detailed screen for that item will appear with more complete nutritional details. 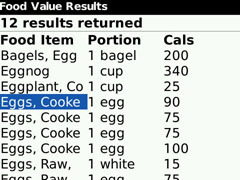 Browse portion and calorie results. 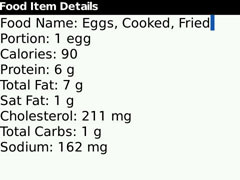 Scroll down and click on any item for more food item details. Click back arrow to view another item, or again to start a new search. Select “Mail Details” to open a new email message edit window with screen contents. We’ve tried to keep the database simple for faster searches and easier reference. If you feel we missed something we’d be glad to add additional records to our system. Just click your blackberry key from the program’s main screen and choose “Give Feedback”. Send us an email with your comments. Thanks for using our program. Help yourself determine weight loss goals and aim for your best health condition. Educate your friends and loved ones on what their target weight should be and support each other in staying fit. Enter in your weight in pounds, height in feet and inches. 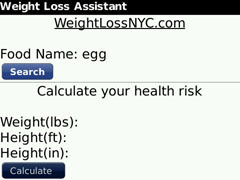 Click Calculate for instant result of your obesity health risk. Have More Questions or Concerns About Your Health? Contact the office at 718-491-5525 to make and appointment to discuss your personal situation with the doctor.